enterprise solid-state storage appliance, providing itscustomers with ultimate reliability for their critical data storage infrastructures. 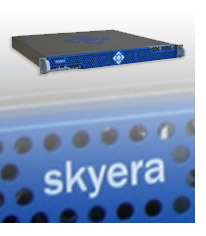 By using MRAM in its MLC NAND Flash-based enterprise solid-state storage systems, Skyera provide customers with enhanced data center fault recovery, reduced system downtime and lower total cost of ownership, without the drawbacks of capacitor-backed RAM solutions. The fast write speed and non-volatility of MRAM allowed Skyera to overcome any point of failure within the system memory while providing the best possible performance to enterprise-class applications. Compared to alternative non-volatile RAM solutions, MRAM eliminates the need for external components such as resistors, capacitors, batteries or super-capacitors including additional power fail logic circuitry. Theelimination of these components improves data fidelity and system form factor while providing the most reliable solution at the overall lowest cost. By enhancing data center and networking fault recovery, MRAM can reduce system downtime and also simplify system design providing an overall lower total cost of ownership.